Since this is our year of running Disney, I had to try my hand at my very first Princess Half Marathon weekend. Since the course is the same as the January races, I have never gone down for these races. 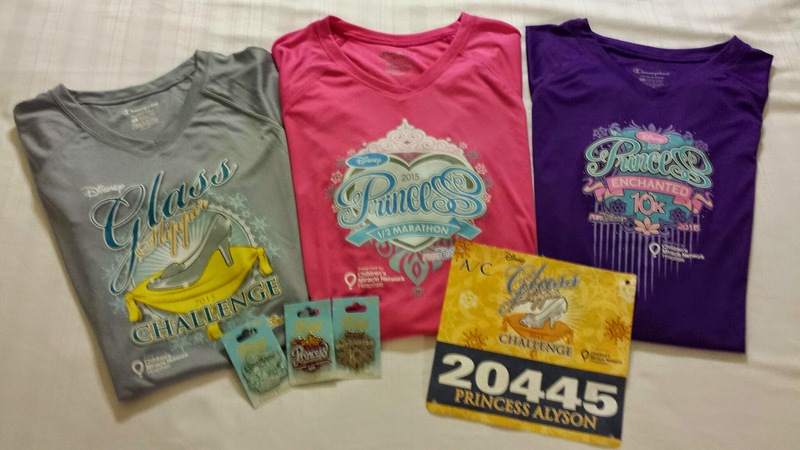 This weekend is the second-largest of the runDisney races. 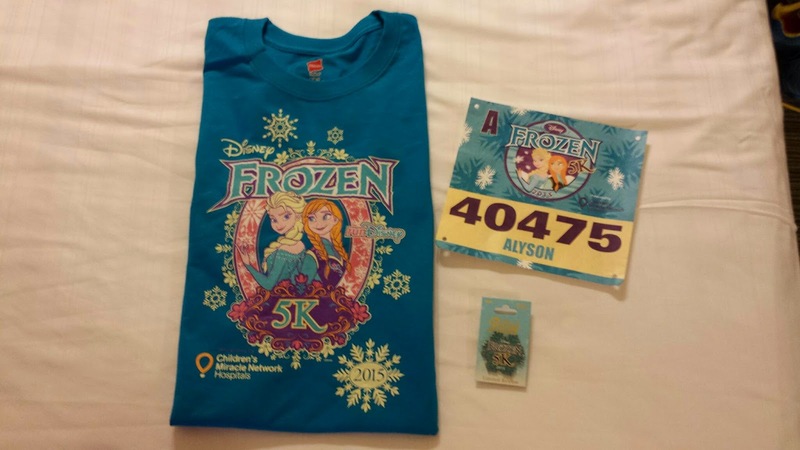 This year, when they announced the Frozen theme, I was in for all the races. That meant I had to be at the expo on the first day to pick up my packets…well…and of course SHOP! The expo opened at 10 am on Wednesday, February 18th. Knowing we would have three early mornings coming up, we slept in a little and had a breakfast at our hotel. We were at our bus a little after 9:30, but we waited a long time for a bus, and ended up having to get a second bus. It was freezing, but we made the best of it and talked to many other runners. We got to the expo and headed straight to the official runDisney booth. I had my eyes on a wine glass and a jacket. We got everything but the Magic Band pretty quickly and headed to checkout. 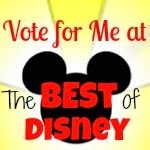 The lines were HUGE, but they were very well organized and it went fast. Unfortunately, the Magic Bands were only at the other location, so off we went to the next official booth. Since we were there, I also picked up a Sweaty Band and got my hubby the cutest shirt—“My favorite Disney princess is my wife” (but he wouldn’t let me take a picture of him in it). He’s such a trooper! Just SOME of the damage I did at the expo! Once the stress of getting the official merchandise was done, I leisurely moved toward getting my bibs, my shirts, and my free bookmark. I also picked up a new Raw Threads shirt for the Tink 10k. We were able to spend some time checking out booths and had a snack before heading back to the hotel. We tried to scam ourselves a spot in the New Balance booth—the newer shoes are pretty cute, but our return time was too late. Guess I know what’s on my list for Tink! Just like most expos, this one was BUSY and a little stressful, but filled with awesome stuff! It always seems to take much longer to get through the expo than what I had planned. If it’s your first time, definitely plan at least 3-4 hours to check out all of the cool stuff. 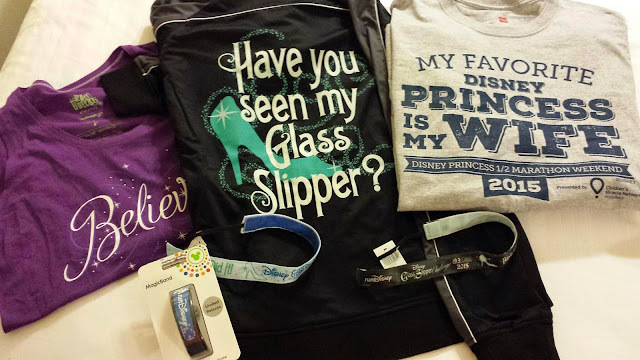 Disney goes ALL OUT for Princess—I think this was the best merchandise and expo for women. Sorry guys, this one is all about the ladies. It was definitely an indication of the rest of the weekend, too. Honestly, even at the expo I knew this would be a race I’d return to in the future!